There are some ancient horrors waiting to trap the unwary. In the cold of mid-winter the ancients would use the light of the sun with industry and sit next to their fires to fend off the demons of frost and dark. They faced fierce fang and claw, antler and hoof, placing meat before their families-keeping them warm and safe. The dark did not change. The cold did not change. But as laziness is the mother of invention, our forebears looked for an easier way. Electricity could make light without the smoke of oil, and without the danger of fire. Electricity could heat without the work of chopping wood or hauling coal. Refrigeration meant that one could hunt one day and not have to throw away the meat that didn't cure well or get canned. Fruits of summer could be kept frozen for winter. Even daily food could be over prepared and saved for the next several days. Except the bowl in the back of the fridge. It lies in the dark most of the time, out of sight, lost in forgetfulness. Only when the door is opened does the light shine and the vague recollection of conscience push at our awareness. Ofttimes the mind puts on an active burst after the head is on the pillow for night but before sleep. A remembrance of the bowl. A promise to get to it in the morning. But those last fleeting moments from where all the good, true, and noble ideas spring are lost in the forgetfulness of sleep. 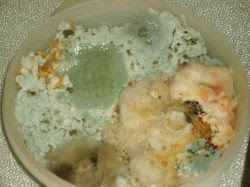 The bowl in the back of the fridge. But you know, sometimes they can be quite pretty. Quick Trip to the Dr.